Well that’s quite a hefty wishlist isn’t it?! When you spend as much time on the internet as I do, you find yourself needing wanting way too many items, especially when it’s coming up to season change. First up we have Benefit’s Push Up Liner and this is simply here because of the amount of blog posts i’ve read on it. It’s quite a pricey item, as are most of Benefit’s cosmetics, but if it’s really as good as everyone keeps saying it is, then I really don’t mind spending £18.50 on it. The only thing I don’t know about this product is how long it’d last when used on a regular basis. So if you’ve had this product for a while, let me know how long it lasts? Merci. The next three items are from Zoella’s new beauty range. I was so super stoked when she announced that she was bringing out her very own range, it’s really encouraging and motivational to see people around my age doing so well for themselves! I kind of want the entire collection but that would have just made for a boring wishlist wouldn’t it! So I decided to pick out my three favourite’s and these would be the Soak Opera (£5)bath soak/shower cream, Creamy, Madly, Dreamy Body Lotion (£5)and the Beauty Bag (£8)with the guinea pig on it. Aside’s from the fact that i’m a little bit of a Zoella fan, i’ve seen some great reviews on the bath soak! All of the items are really reasonably priced and the beauty bag is just so adorable! Who’s already ordered these items? I swear, Lancôme’s entire range is just beautiful. I love how sleek and sophisticated their packaging is and this palette is tres jolie! It brings an all over, a lid, a crease and a highlighter shade and a liner. I’m really loving the look of purple smokey eyes this season so this is a certain must have to achieve that autumn trend. It’s retail is $55, so please, help a broke girl out and if you find a dupe, let me know! Another blogger favourite are the Rimmel London Scandal Eyes Shadow Sticks, Bag Girl Bronze in particular. I’ve seen so many great make up looks by simply just pairing this shadow stick with a nice highlighter and good ol’ winged liner. At just £4.49 it’s definitely a winner. 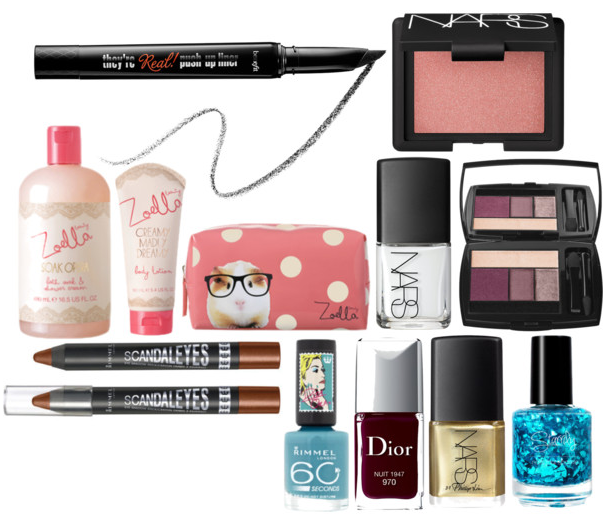 I’ve gone a bit nail polish crazy in this month’s wishlist, oops? Honestly, I really don’t need any more polish’s, saying that, my buddy Kathy is even less in need of them and her collection keeps growing, so why can’t mine? Mine’s really not that grand in comparison haha! There are two of Nars’ bad boys and they’re Ecume (£15), an opaque white(which I still haven’t purchased, oops?) and a Phillip Lim for Nars polish in the shade Gold Viper which I think is just perfect for the Christmas period! It’s limited edition so make sure you grab yourself one right now! Currently available for £15. I grabbed myself a couple of the Rita Ora for Rimmel polish’s a while back and they’re really great quality so naturally, I need more now! I love this bright teal shade, Do Not Disturb, another item that’s not really a/w themed but I love it all the same! On a whole Rimmel’s nail polish are pretty good quality and for £3.69, cheap as chips! Dior certainly know where it’s at with their polish colours this season. This shade, Nuit 1947, is a rich berry colour and I really think it’d suit all skin tones. Another pricey one at £18, but so worth it! Last but not least is this shimmering mermaidesk nail polish from Nylon by Starrily and i’m honestly in love with it. It has a shattered glass effect and it really looks like the best thing since crackle nail polish. If you follow the link you can see a photo of what the polish looks like on, tell me you’re not drooling?! $10 is about £6-£7, nothing for such a beautiful polish! What’s in your favourite’s this month? Let me know below!